Growing and maintaining a natural grass field in the Southwest United States is challenging enough due to its arid climate, but it is nearly impossible when the field is also in constant use. 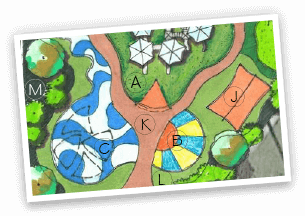 To deal with this challenge, designers were already looking to employ synthetic turf throughout the play area. 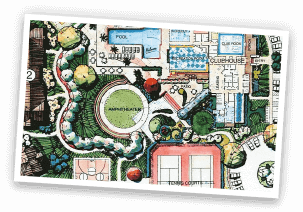 By incorporating multiple colors, our team developed this innovative field that could be used for kickball and Wiffle ball games without the need to drag out bases and a pitching rubber. To ensure the safety of the students, specialists from Play It Surfacing installed a poured-in-place (PIP) rubber safety surface under the playground equipment. The height of the equipment required a fairly thick base to meet ASTM F1292 standards for impact attenuation so a deep foundation was installed to minimize the transition to the surrounding areas. By incorporating the PIP surfacing flush with the rest of the area, the playground minimizes trip hazards and complies with ADA guidelines for accessibility. 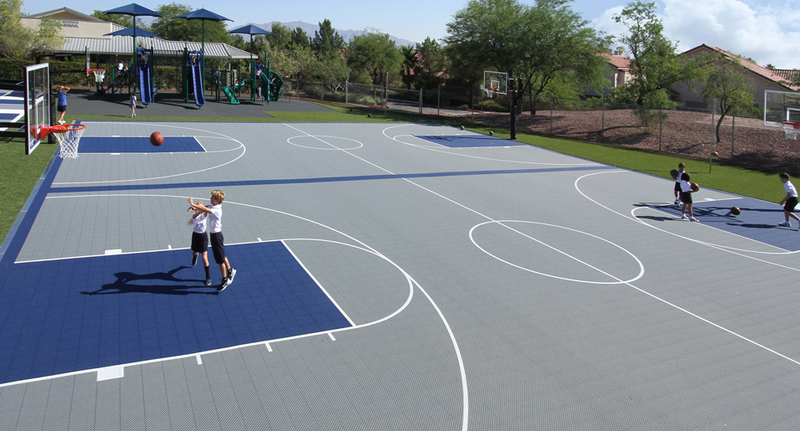 With its numerous color options and fast-draining, open-grid solution technology, VersaCourt’s outdoor court tile provided an awesome option for enhancing both the look and appearance of the new playground. 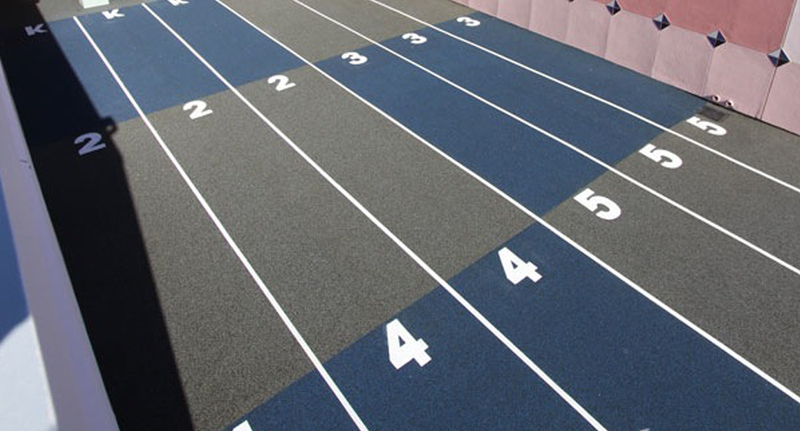 This low-maintenance surfacing option is a comfortable and safe alternative to concrete and asphalt courts. 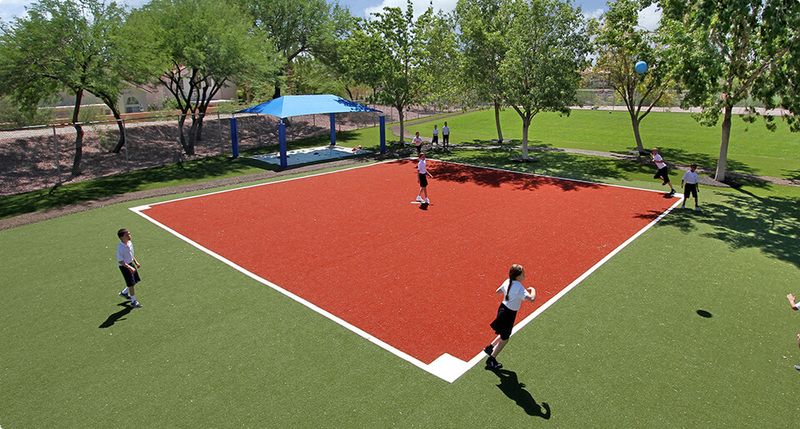 The team at the Recreational Group not only designed and installed the surfacing, but the courts were outfitted with industry-leading GoalSetter basketball goals. Bonded rubber mulch walkways from Play It Surfacing were incorporated into the design to help direct the flow of children throughout the play area. 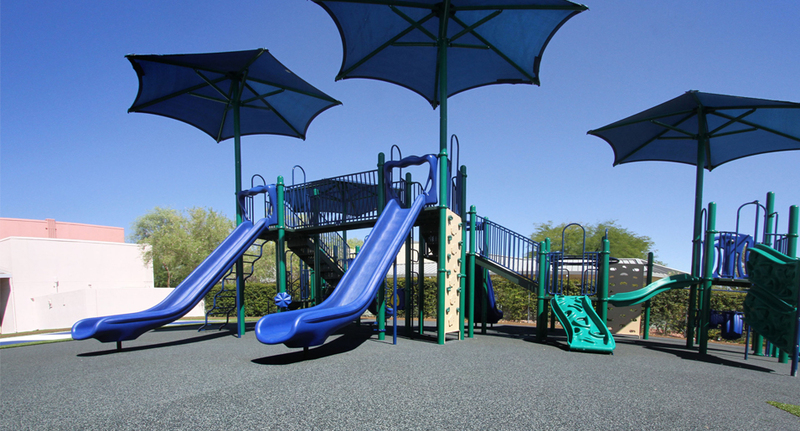 The strategically located walkways help deter children from walking too closely to those playing on playground equipment or through active courts or fields. 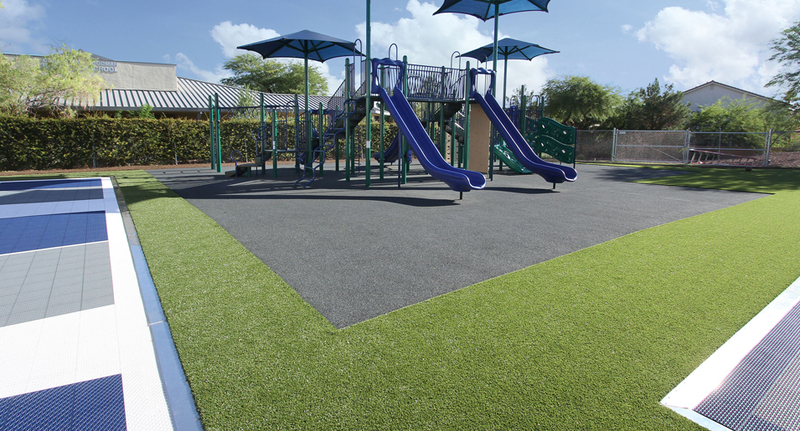 Like all of the playground’s surfacing, the Play It Surfacing bonded rubber mulch walkways stay clean in any weather and require virtually no maintenance. 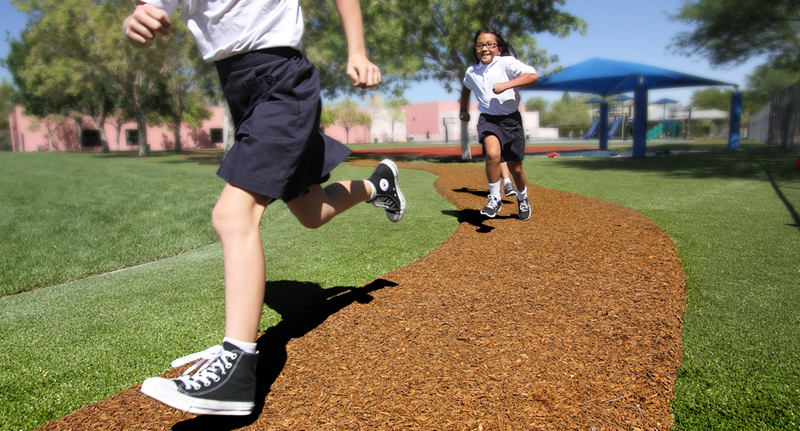 Plus, unlike loose fill products like wood mulch or pebbles, the bonded rubber mulch does not get tracked into the school buildings or get into the student’s clothes. 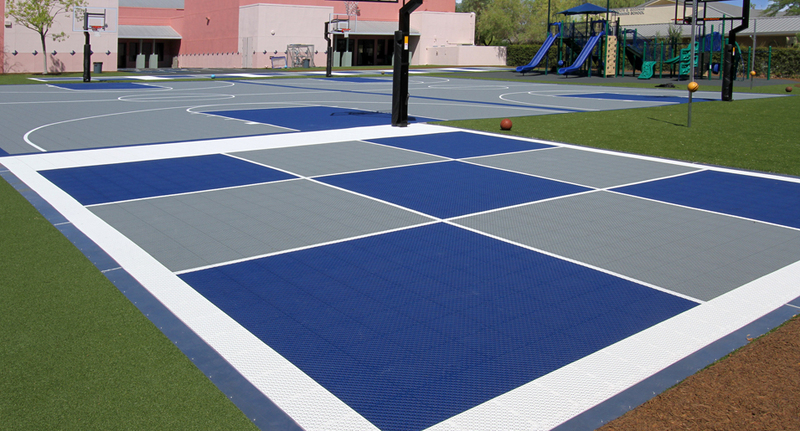 After the basketball court was integrated into the design of the play area, our designers looked to further utilize the versatile nature of the VersaCourt tile by incorporating sets of 4-Square Courts and a life-sized Tic-Tac-Toe grid. To help further organize the students return to class after their fun, this poured-in-place rubber surfacing was designed as a place for the kids to gather. 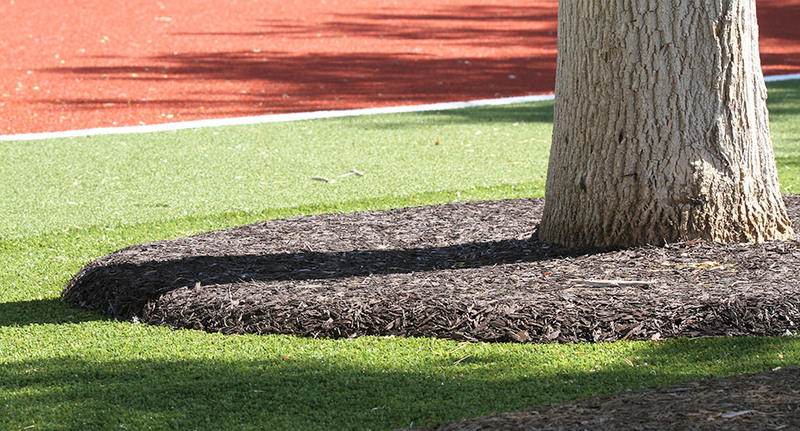 Play It Surfacing bonded rubber mulch was integrated throughout the playground, including rubber tree wells. These tree wells provide beautiful, low-maintenance landscape accents throughout the Meadows School grounds.